In March 2015, the Solar Impulse took off from Abu Dhabi on a journey to fly around the world while using zero fuel. As a solar powered electric airplane, the Solar Impulse flies in the face of conventional wisdom, in that it flies long distances without burning liquid fuel. 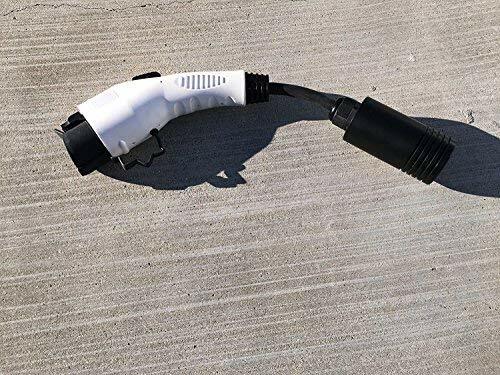 It instead collects electricity through solar panels embedded in the airplanes surface, storing the electricity in batteries. 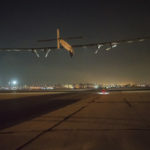 The batteries enable flying at night, and the Solar Impulse has taken several multi-day trips such as the just-completed flight from Seville Spain to Cairo Egypt, which took 48 hours. The vast majority of airplanes fly on fossil fuels, with the primary exception being a few instances of biofuel experimentation. 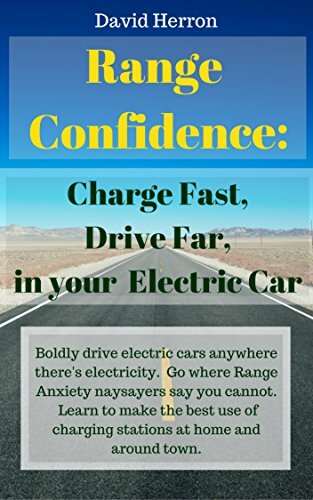 Conventional wisdom says an electric airplane is a non-starter for anything but minuscule flights. Indeed, there are some electric trainer aircraft on the market now with flight times of an hour or so, enough for a training flight and not much more. How, then, could an electric airplane dare to travel around the world? 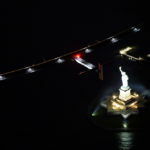 The Solar Impulse is about to finish its around-the-world adventure, and has completed several multi-day long distance flights including crossings of the Pacific Ocean (Japan to Hawaii, Hawaii to Silicon Valley), the Atlantic (New York to Seville Spain), and now the length of the Mediterranean (Seville to Cairo). Its method for completing long distance flights demonstrates a model we all need to grok, and perhaps adopt to power our cities. It’s a model the plant kingdom has practiced for hundreds of millions of years. 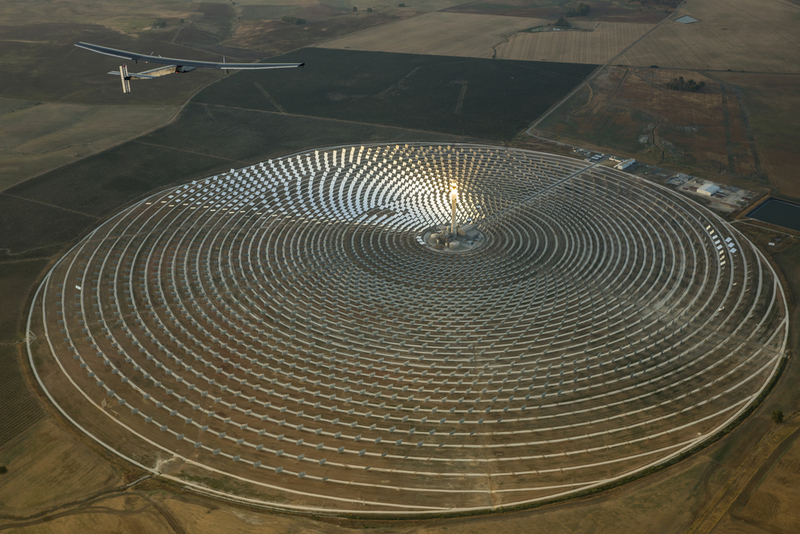 Seville, Spain, July 11th 2016: Solar Impulse is flying over the Torresol Energys Gemasolar Thermosolar Plant, which is partially owned by Masdar, Solar Impulses host partner in Abu Dhabi, after taking off from Seville to Cairo, Egypt with André Borschberg at the controls. 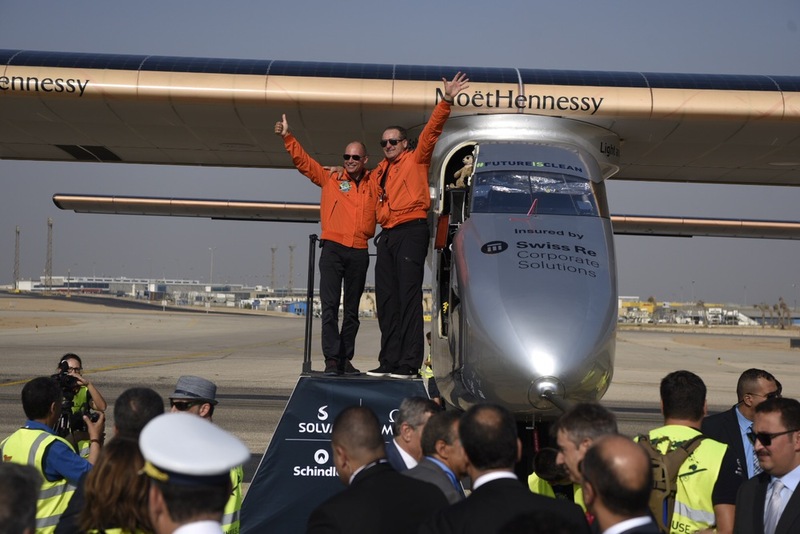 Departed from Abu Dhabi on march 9th 2015, the Round-the-World Solar Flight will take 500 flight hours and cover 35000 km. Swiss founders and pilots, Bertrand Piccard and André Borschberg hope to demonstrate how pioneering spirit, innovation and clean technologies can change the world. 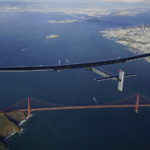 The duo will take turns flying Solar Impulse 2, changing at each stop and will fly over the Arabian Sea, to India, to Myanmar, to China, across the Pacific Ocean, to the United States, over the Atlantic Ocean to Southern Europe or Northern Africa before finishing the journey by returning to the initial departure point. Landings will be made every few days to switch pilots and organize public events for governments, schools and universities. The Solar Impulse has solar panels covering every surface. Those panels collect enough electricity during the day to not only power the airplane for daytime flying, but enough energy is collected so the Solar Impulse can fly all night. In the morning with the battery pack standing at about 30%, the Solar Impulse begins collecting power again and can fly for another day. That is, so long as the crew ensures the Solar Impulse is not in a cloud bank at sunrise. The only limit to the Solar Impulse’s flight time is the endurance of the human pilots. Making a multi-day airplane trip is a full time job, and this aircraft only has enough room for one occupant. The pilot has a bit of room for moving around, practicing yoga, lying down to snooze for 20 minutes at a go, eat foot, use the toilet, etc. Otherwise it is theoretically capable of flying perpetually. Plants follow this pattern every day. They collect energy through photosynthesis all day, storing that energy so that the plant can survive through the night and/or through the winter. Our cities could adopt solar power and energy storage systems to do the same thing, collect energy throughout the day to power the city through the night. 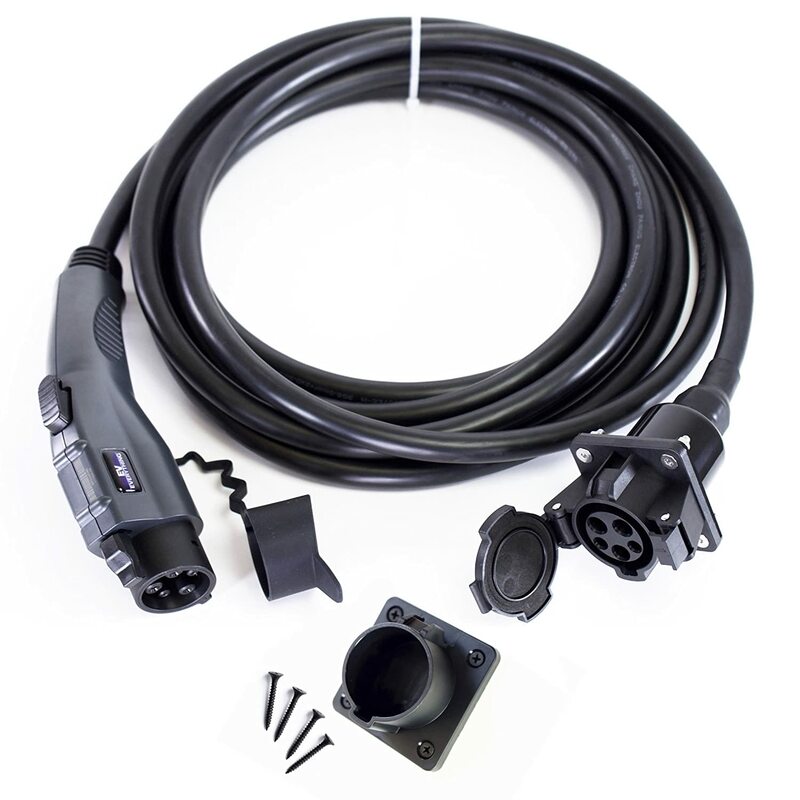 It’s relatively easy to do the same at an individual building. 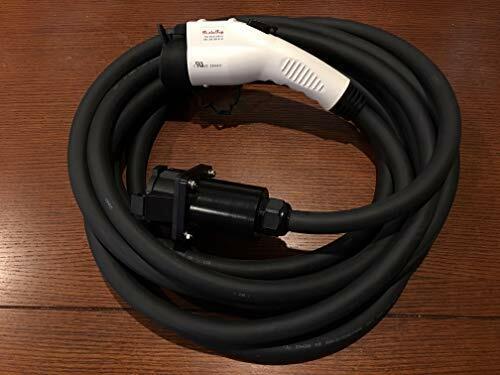 Doing this for a typical house requires a 10-20 kiloWatt-hour battery pack, a solar array, and some power electronics, all of which are available from several vendors off-the-shelf. 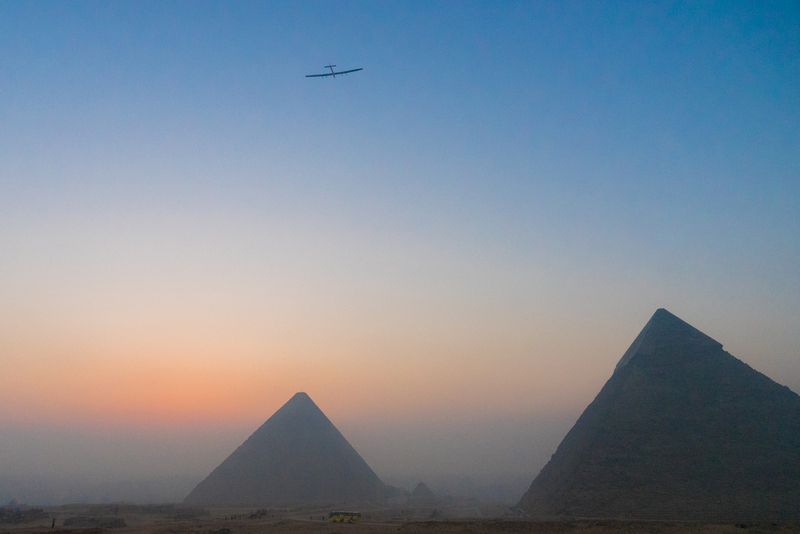 What’s next for the Solar Impulse is that Bertrand Piccard will fly from Cairo to Abu Dhabi. The team hasn’t selected the day. As they’ve done for the entire journey, the timing of the flight will depend on the weather. 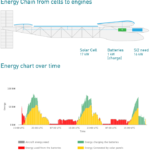 The Solar Impulse needs calm smooth air, and of course clear skies to catch the most sunlight. Bertrand Piccard and Andre Borschberg greeting the crowd in Cairo Egypt, following Andre’s two-day flight from Spain. 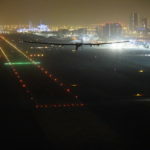 Cairo, Egypt, 13 July 2016 – On its journey around the world, Solar Impulse 2 (Si2) – the solar airplane of Swiss pioneers Bertrand Piccard and André Borschberg – landed in Egypt after a flight of two days and two nights (48 hours and 50 minutes) without fuel. This flight, which crossed the Mediterranean Sea from west to east and covered a distance of 3’745 km (2’327 miles) powered only by the sun, was the second to last leg of the attempt to achieve the first ever Round-The-World Solar Flight, the goal of which is to demonstrate how modern clean technologies can achieve the impossible. At the controls of Si2, André Borschberg touched down at the Cairo International Airport, at 07:10 local time (UTC+2), after an iconic moment flying over the pyramids of Egypt completing a flight of two days and days nights – at a maximum altitude of 8’534 m (28’000 feet) and average speed of 76.70 km/h (47.66 mph) – that took off from Seville on 11 July at 6:20 am local time (UTC+2). This flight, connecting Europe to North Africa by crossing the Mediterranean without a drop of fuel, marks the penultimate leg of the first Round-The-World Solar Flight as well as the last flight of André Borschberg in the context of this pioneering adventure, before Bertrand Piccard will take the controls for the last leg to Abu Dhabi.